Clubs, Scouts, Civic Groups, Churches, and other organizations can all take part in making a difference in the lives of children and teens with cancer. Check out how you can get your organization involved. Host a Mad Hatter Drive during September, October or November. Host a Fundraising event during the rest of the year with your organization. Host a Hat Drive event during the rest of the year. Start a HOC Heroes Club at your school. Challenge a rival club to a fundraiser competition. Host a Dance-A-Thon or any type of A-Thon and have people pledge for the time you spend at the event. Have a virtual fundraiser and email family and friends to donate. Set up your own online fundraising page at: http://fundly.com/hatsoffforcancer. Knit or crochet hats for cancer patients (please use very soft yarn that is machine washable), all sizes accepted. Hold a Bake Sale near your school cafeteria. Organize a concert at a local hot spot or host a Coffee House open-mic night. Go to your local grocery store or local shop and see if they’d be willing to help host a fundraiser by asking their patrons to donate $1-$5 and write their name on a paper hat (download here) to put up around the store. 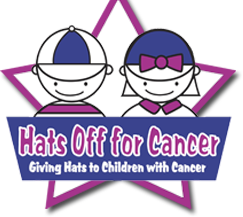 Purchase the designer Hats Off For Cancer t-shirt. Ready to start planning your event? Register here. This list is always growing! We are always open to new ideas. Email us with any comments, suggestions or questions.